Assistant Professor of Physical Therapy Dr. Christi Williams and her “Rehab Lab” Layla spend countless hours with community members through their work as a trained pet therapy duo. Frequenting the halls of Vanderbilt Medical Center, Vanderbilt Children’s Hospital, Vanderbilt One Hundred Oaks and beyond, Williams and Layla are well known for their therapy services through Pet Partners, a local nonprofit. Recently, Williams and Layla (along with puppy-in-training Jackson!) were featured on a Pedigree pet commercial where Williams detailed Layla’s work and described the importance of her diet. 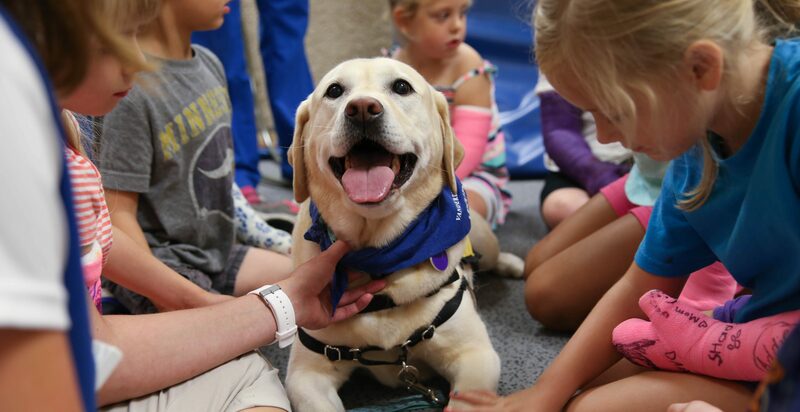 Featuring video and images from her work in the hospital, the 8-year-old yellow Labrador Retriever can be seen loving on patients, playing with Jackson and prepping for work once her harness has been secured. To view the commercial in its entirety, click here. To read a recent Vanderbilt University Medical Center article on Layla and Williams, click here.